This plaque on the shore of Hidden Valley’s Paradise Lake marks the location of the Butterfly Garden. Volunteers first cleared a large lakeside area of invasive Asian honeysuckle. Children then helped fill the garden with plants that attract and nourish butterflies. 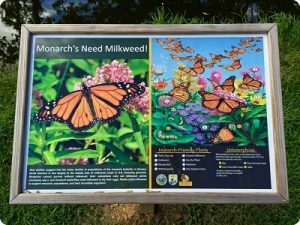 The endangered Monarch in particular, cannot survive without milkweed. Other butterfly-friendly plants include, sunflower, goldenrod and New England aster. The Hidden Valley Lake Property Owners Association conducts a deer culling bow hunt when necessary to manage the size of the herd within the community. According to the Indiana Department of Natural Resources (INDNR), HVL’s acreage should not support more than 56 deer. A 2010 fly-over deer count indicated over 300 deer within our boundaries and another 300 in the immediate surrounding area. Subsequently, the community voted to initiate a deer management program to preserve our woodlands and reduce deer/auto collisions. We are currently maintaining the herd at about 100 deer. If the data from the annual helicopter deer count indicates a reduction is necessary, the POA petitions the INDNR for approval to cull during the next hunting season. Deer culling tags are issued to HVL POA-approved hunters, granting them permission to discharge a bow-type weapon and harvest deer within their assigned culling zones. 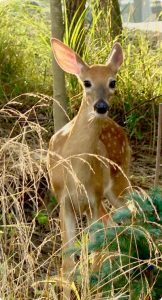 • View the January 2106 Deer Count Report. A major focus in our community is our 150-acre lake. Families enjoy swimming at the beach and relaxing on their pontoon boats. Fishermen compete in organized tournaments or just spend peaceful hours casting for bass. Ducks, geese, herons, and even eagles frequent the waters providing excellent birdwatching opportunities. Residents hike across the dam, and photographers capture images of sunsets over the lake. 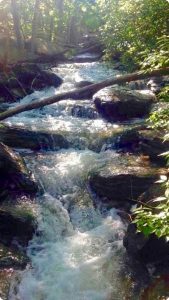 View the Clean Water Management Act. For more information, see Natural Resources Articles. Did you know that HVL staff members monitor our lake and ponds throughout the summer to make sure that levels of E. coli are within acceptable limits? Readings for all 6 of the small ponds and for 4 spots in the main lake (including the beach and dock areas) were all satisfactory at the end of May. If the tests ever indicate a problem, we will let you know via email and Facebook, so make sure you are signed up to Keep in Touch to receive HVL announcements.